It's not an accident that we choose to work with prominent manufacturers. 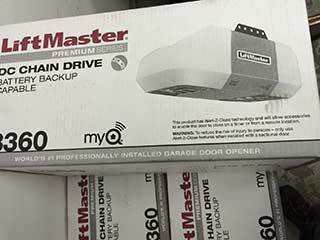 When our customers are searching for a new garage door opener, we always include Liftmaster in the options presented to them. Quality is a key reason why we suggest investing in these opener models. Their products are tested and we have concluded that the units are incredibly durable and a great option for those who want to invest in a good system. As an innovator when it comes to electric opener systems, Liftmaster gives people exactly what they're looking for. Their products function with rolling codes and fully meet all the UL 325 safety guidelines. The newest opener series of the MyQ technology will also allow you to control the lights of your house from afar. Such initiatives are not merely revolutionary, but an illustration of the efforts made by Liftmaster to meet the needs of American life today. What Makes This Brand Unique? With distinct features, like the timer-to-close that will close the door in a number of minutes according to how you have preprogrammed it, or the alert-2-close function that produces visual and audible warnings when the door is closing down, Liftmaster has truly asserted its commitment to stand out in the market. Those people searching for a novel opener system that enhances their safety as well as convenience will find the internet getaway in combination with a new MyQ opener an excellent idea. Essentially this function allows you to take control of your garage door from anywhere in the world – whether you're in the office or abroad. It's a great added bonus when it comes to the security of your property. We're here to introduce you to all the products we think will be suitable for your situation and property, and you can always be sure of the quality of the manufactured parts you're receiving. In our opinion, Liftmaster is one of the strongest opener manufacturers around at the moment – we look forward to seeing further revolutionary steps in the future! Don't hesitate to get in touch with us at Garage Door Repair Missouri City with any further questions relating to your opener system and the replacement options available to you.